Hi friends! 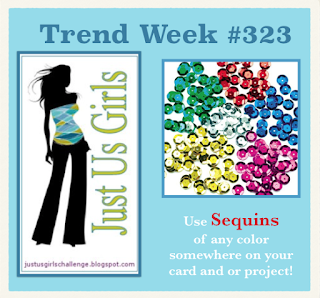 I'm hosting the Trend challenge over at Just Us Girls this week, and I chose SEQUINS as the trend. So how many of you have tried something Jennifer McGuire did and thought "how does she make it look so easy?" Hahaha! I recently bought a fuse tool. I got it with a 50% off coupon at AC Moore and it was cheap! 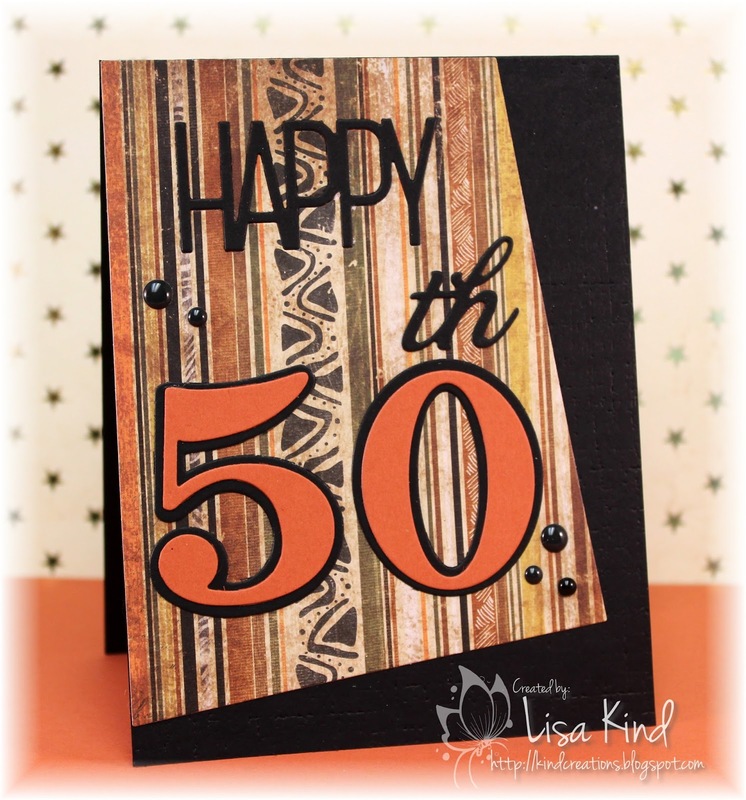 So I checked out her videos on using the fuse tool and cased a card she did. But it didn't go as smoothly as hers! I won't go into detail, but let's just say this card took longer than it took Jennifer to do! She's just so amazing! This is the video I watched to create my card. Anyway, I used the fuse tool and created a round pocket then filled it with sequins and sealed it up. I attached it to the card base. 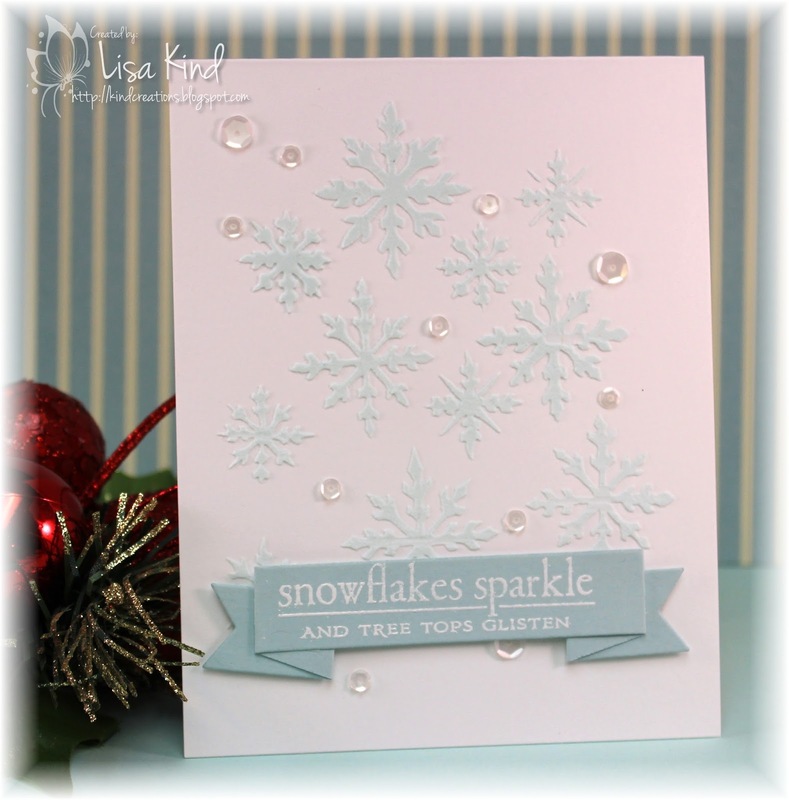 The I cut the round opening in the blue panel and used a stencil and texture paste to add the "snow flakes". Santa and Rudolph were die cut and colored with copics and adhered. That panel was added to the base with dimensional tape. You can see more from our design team on the JUGs blog. Hi friends! 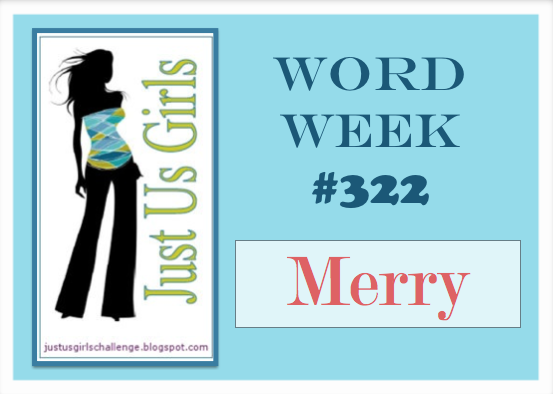 It's getting closer and closer to that date and Ina chose a word for our Just Us Girls Word Week that will help us get those cards done...Merry! I saw this post on the Craftsy blog for a One Sheet Wonder technique, so I thought I'd try it. 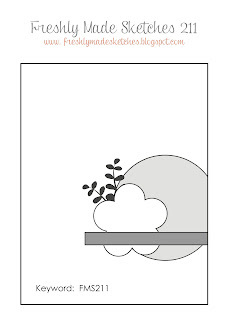 This is one of those cards. (I'll post the others later). Once you cut the 12" x 12" paper, you should be able to make 14 cards! I had this paper from Michael's I think. I just love the plaid! 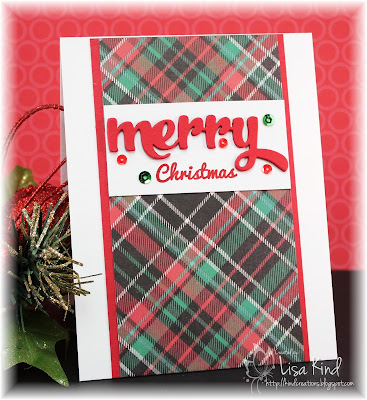 The "merry" was die cut four times and stacked. I stamped the "Christmas" using my Misti then adhered the die cut above it on the white panel. I added sequins for some sparkle. 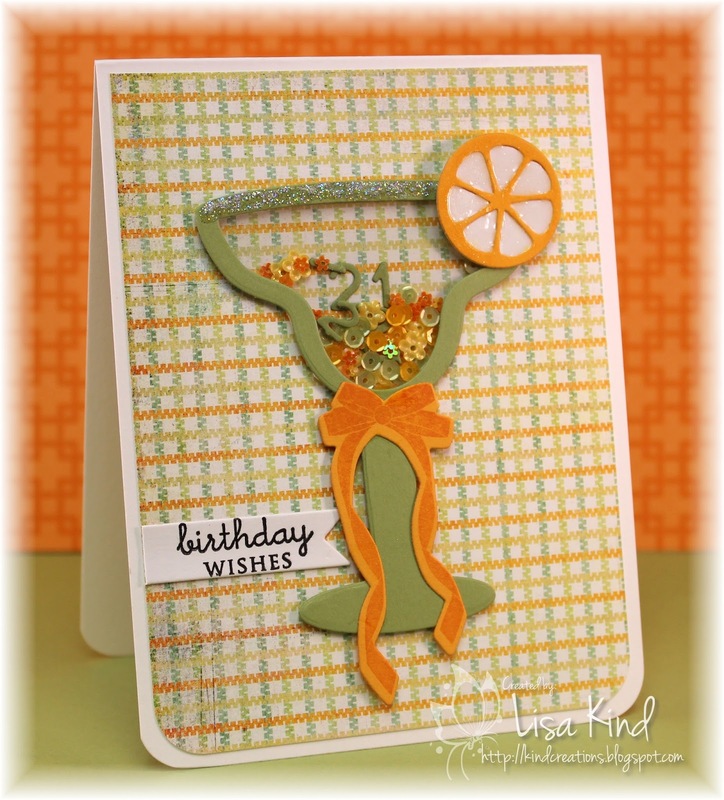 You can see more inspiration from the JUGs design team on the JUGs blog. 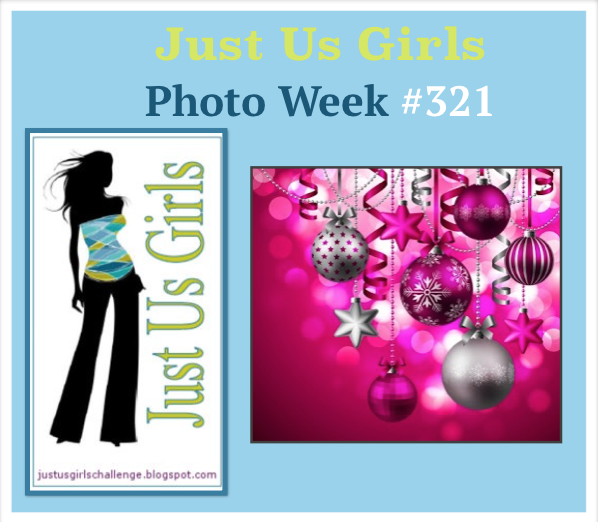 It's Photo Week at Just Us Girls, and Vicki chose this amazing photo! I started my card by sponging some distress inks on water color paper, then added some water droplets to mimic the bokeh look in the photo. Then I die cut the wreath from silver sticky back paper and adhered it to the panel. I did the same with the bow. 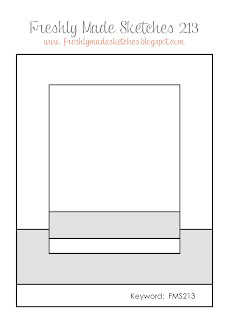 The word was die cut four times and stacked for dimension. I added some silver sequins to finish it off. 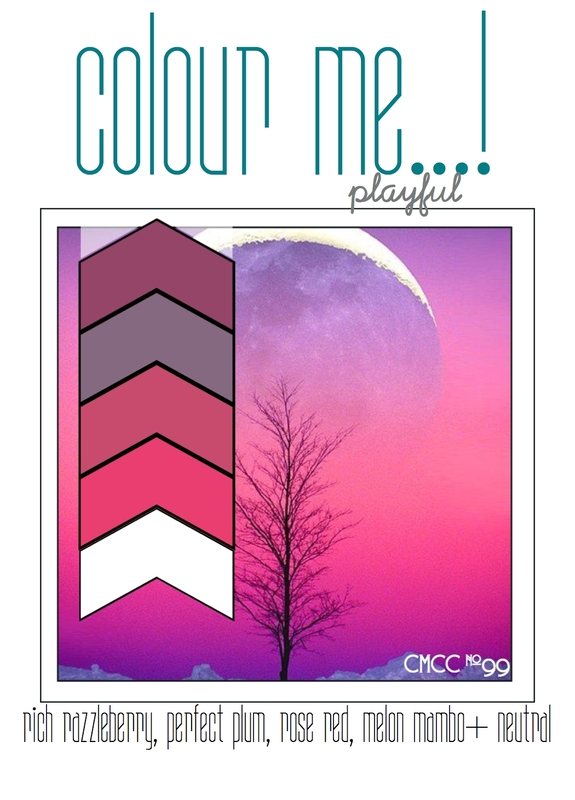 This also fits in with the Colour Me! challenge. You can see more from the JUGs design team and our guest, Louise Hodge, on the JUGs blog. A big thank you to Louise for being such a great guest for the month of November! Happy Thanksgiving to all my American friends! I hope you have a great time with family and friends! I'm hosting dinner at my home today for 10 of my family members! Wish me luck! 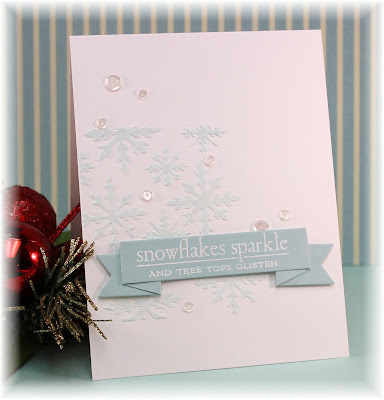 I love snowflakes and have many snowflake stamps and dies. I had this snowflake already die cut, so all I did was cover it with Glue 'n Seal and rock candy distress glitter. It sparkles so nicely! And the paper is one of my all-time favorites. I still have a good amount of it left. 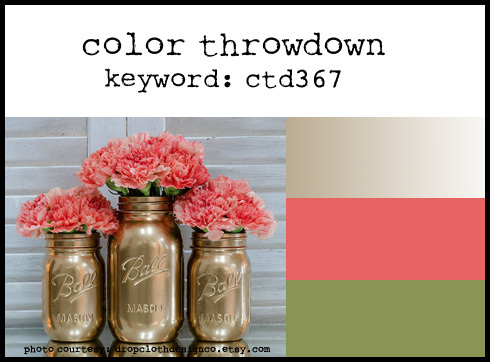 The colors are just so pretty...love the red and brown! I finished it off with a banner sentiment and sequins. 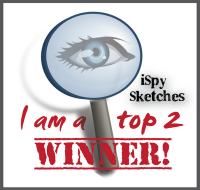 I used this sketch from Sunday Stamps. 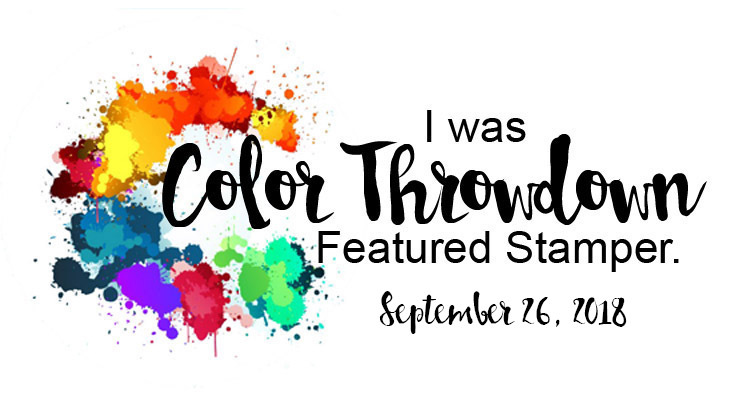 You can see more inspiration from the Time Out design team and our guest for this challenge, Ashwini on the Time Out blog! Hi everyone! I made this card last week and wasn't going to post it, but when I looked at it again I thought I'd go ahead and post it. I had a hard time with those red stickles...I think mine are old and I need a new bottle. This wreath has some holly leaves and pine needles in it that I die cut out of green paper. 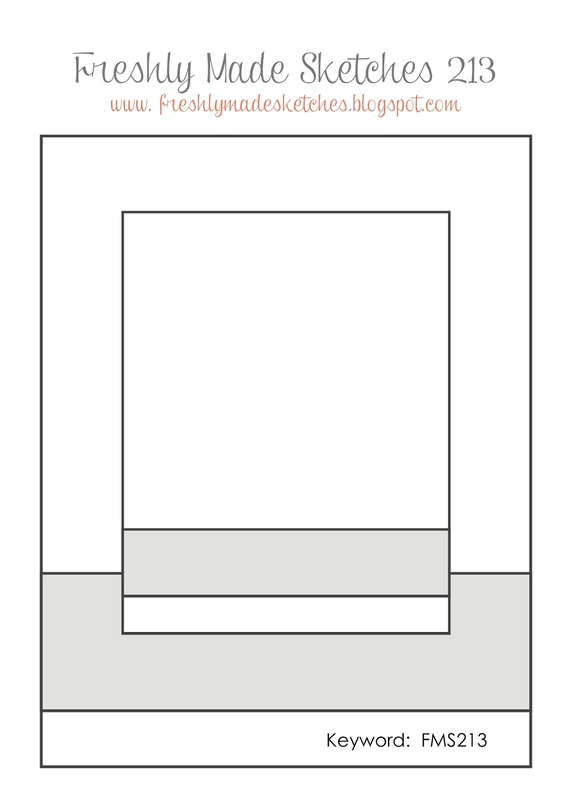 The base was cut from brown. 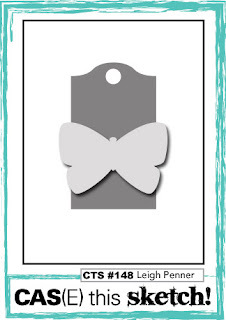 I added this bow that I just am smitten with! I die cut it from red and also stamped it in red. I added the sentiment on a folded banner die. The main panel was impressed with a woodgrain impression plate and inked up with some brown ink. Another card for the Christmas card pile! Lots more to do! I went to a 50th birthday party for a male friend yesterday and had to make a card. I don't know about you, but I have such a hard time with masculine cards. However, this one came together rather quickly. 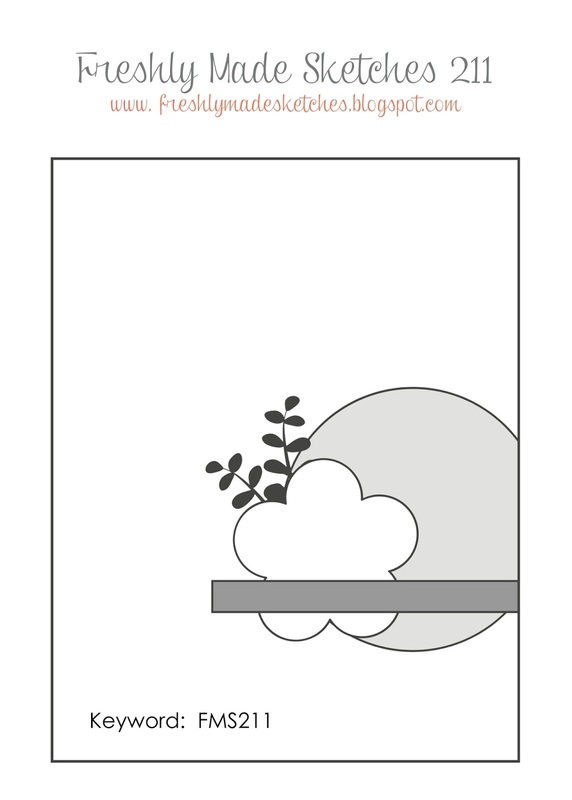 I used a layout from another card I made a while ago (are there not as many sketch challenges out there than there used to be?). I usually need a sketch to get me going and I'm not good with them, so I sort of CASED myself. I thought these colors were good for a masculine card. The "happy" was originally inlaid, however I die cut it in the rust paper and it didn't show up very well. I tried to pull it out, but only got part of it out! So the black one just went over the other one. I do like it better! The black base was impressed with the linen impression plate too. It's hard to see. Hi friends! 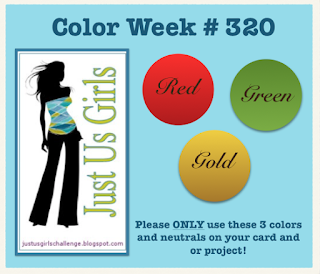 Just Us Girls has a color challenge going on this week, and Sharyn chose red, green, and gold for us. 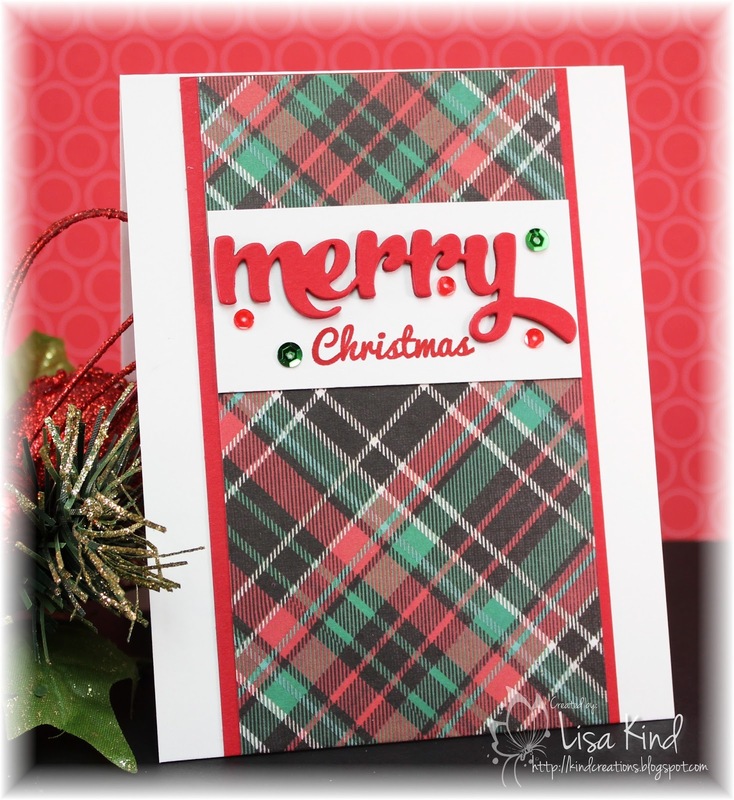 Great for making those holiday cards! I cut this die out of white cardstock and colored it with copic markers. 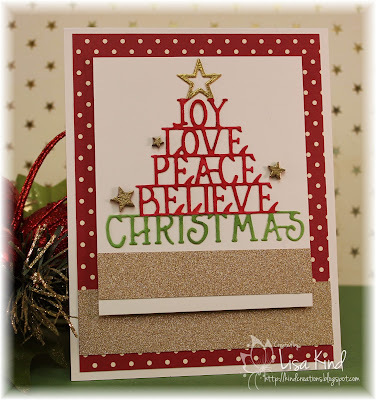 The star on top was embossed with gold embossing powder then adhered it to the cream cardstock. I added some gold glitter paper and wooden stars also embossed with gold embossing powder to match the star on the die. The main panel is popped up on fun foam for some dimension. Strips of gold glitter paper was added as well. 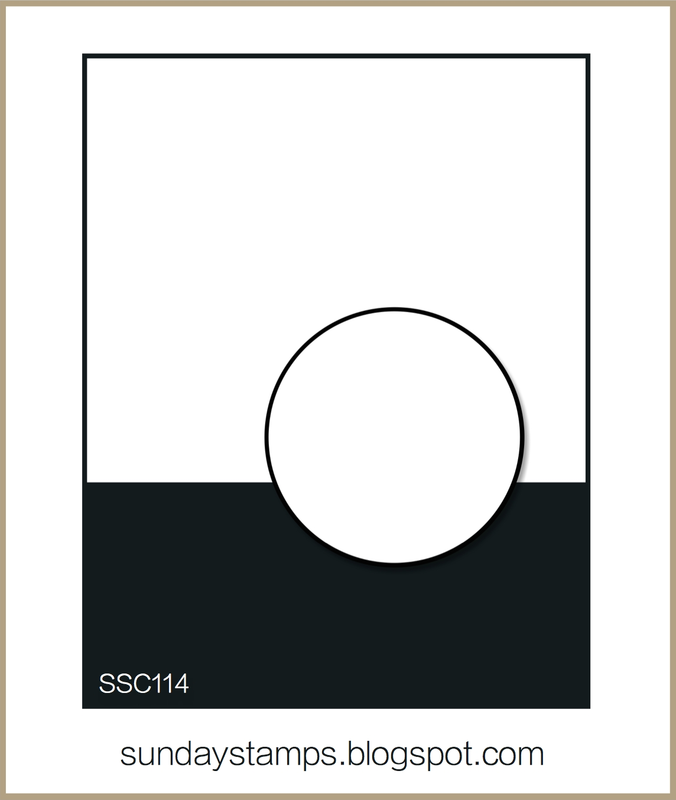 I used this week's sketch from Freshly Made Sketches for my layout. You can see more from the JUGs design team and our guest, Louise, on the JUGs blog. Hi friends! 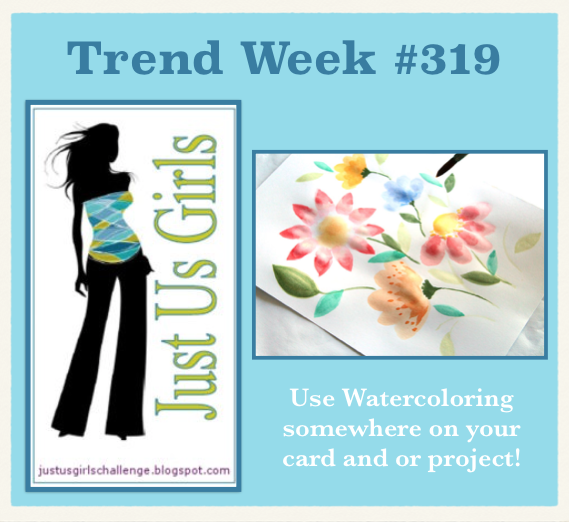 It's trend week over at Just Us Girls, and Maria chose watercoloring. 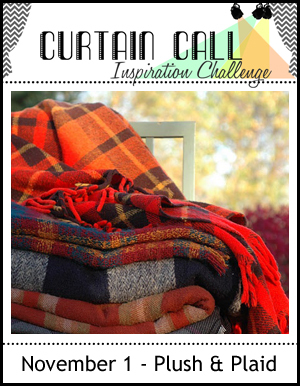 It's so popular in blogland and a perfect challenge for us this week. This is the second week in a row that I made a sympathy card. The mother of our very good friend passed away this week, and today is actually the funeral. So here I was making another sympathy card for this challenge. The salon where I get my nails done has this painting hanging on the wall that I always admire. I've thought several times that I should watercolor a panel like it. Here's a picture of that painting. You can see more inspiration from the JUGs design team and our guest, Louise Hodge, on the JUGs blog. 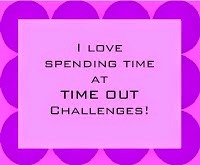 It's time for another challenge on the Time Out blog. This week we are CASE-ing this cool card by Karen. I had some colored paste left over, so I created another card. 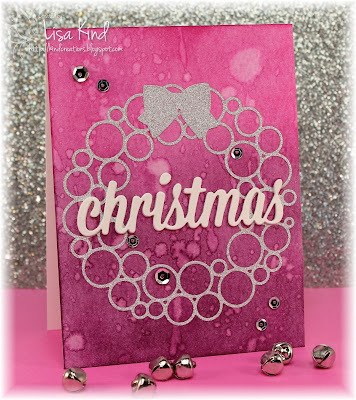 However this time I covered the card base with embossing using the whole stencil. I finished it off in the same manner. 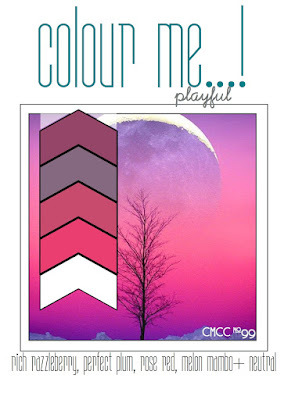 You can see more from the Time Out design team and out new guest designer, Jen. My niece Maria is turning 21 today! She is the sweetest girl and so hardworking. She is studying to be a physician's assistant, and all she does is study or work during her off times. I wanted to make a special card to celebrate the occasion. I recently purchased this margarita die and it was sitting on my desk waiting to be used. I thought it would be a cute card for her. 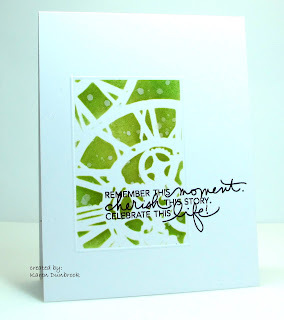 I die cut the glass from pear paper (Maria loves green) and found the perfect pattern paper to go with it. I die cut some numbers from different fonts and adhered one of them behind the shaker so it would be stationary. Then I added some sequins and the other numbers I die cut. 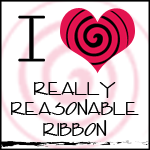 The ribbon is actually from a Christmas set, but I thought it looked festive on the glass. I added some star dust stickles on the rim of the glass (to resemble sugar) and the piece of fruit. The inside of the fruit has some glossy accents on it to make it look juicy. The sentiment finishes it off. I loosely followed the sketch from CAS(E) this Sketch. You can sort of see where I was going with it, right? Hello crafty friends! I was having a crafty day yesterday afternoon just playing around and also getting some DT work done. But it was cut short because I received a call from my mom's assisted living place that she had fallen and hit her head. There was apparently lots of blood and they couldn't stop the bleeding, so they took her in an ambulance to the emergency room. We were there for four hours while they checked her out. They right away knew that it was just a contusion (a break in the skin) and that she didn't require stitches or anything. So she had a good night's sleep and she was fine today, thank goodness! Anyway, I did manage to make two tags for the 25 Days of Christmas Tags challenge. I love tags! I don't know what it is about them, but I just adore making them. 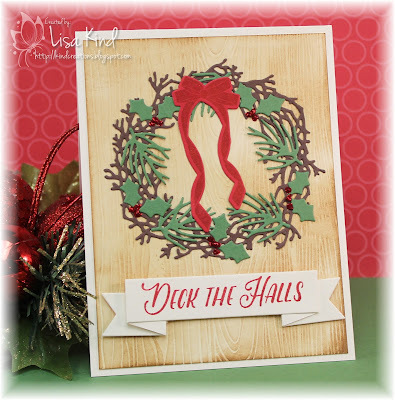 On Day 1 of the challenge, Tracey made a tag with a wreath stamped on it, and it reminded me of some PTI stamps and dies I had that I could use to create one too. I think I've purchased all the Enclosed series stamps and dies, and guess what? They've never been used (of course!). So I had to use them for this challenge. 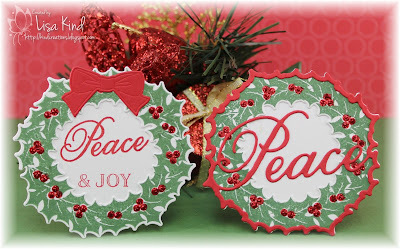 The one on the left was die cut in white then stamped in green ink and red for the berries. 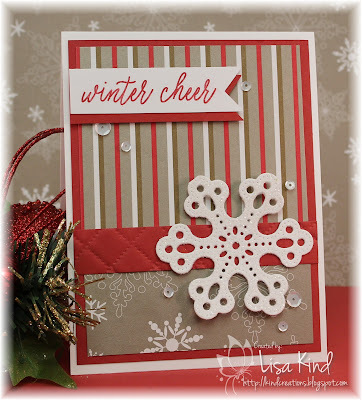 Then I stamped the sentiment in the center with red in as well. Red stickles were added to the berries and a die cut bow at the top. On the right one, I did the same, but added the Peace overlay and omitted the bow. 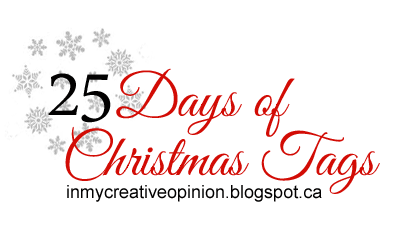 If you haven't checked out the 25 Days of Christmas Tags, check them out! Tracey has guest artists and prizes too! Boy am I glad the weekend is here. It wasn't a bad week, it's just that I love my weekends! I hate waking up to an alarm! Anyway, there's a new challenge over at Just Us Girls. This week is our word week, and Sue chose the word "stripes". 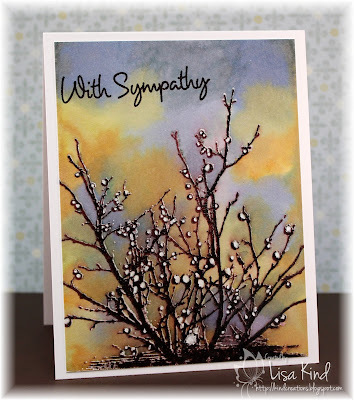 Unfortunately, I needed a sympathy card. 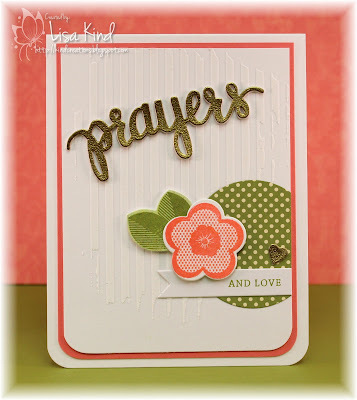 Fortunately, I had this great Prayers die and stamp set. First, I had to create some stripes for the challenge. I don't know if you can see them, but I used a stripes stencil and some white texture paste to create them on the main panel. While that was drying, I created some gold paper by covering some white paper with Versamark and gold embossing powder. The prayers word was die cut from that as well as the little heart. I die cut and stamped the flower and leaves. I added the pattern paper circle and banner. That main panel was backed with a piece of coral paper. I'm playing in a couple of other challenges. I used the sketch from Freshly Made Sketches. And I used the color palette from Color Throwdown. 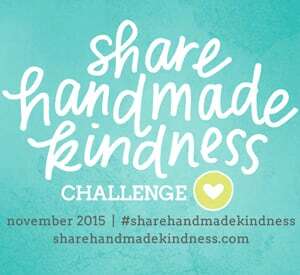 And then I thought I'd enter this into Jennifer McGuire's Share Handmade Kindness Challenge. This card is going to my cousin who lost her husband recently. You can see more from our design team and our new guest for November, Louise Hodge, on the JUGs blog. Happy fall back day! And because of falling back, I had some extra time this morning to create a card! I found some challenges to play with and came up with this card. It includes some new products too. 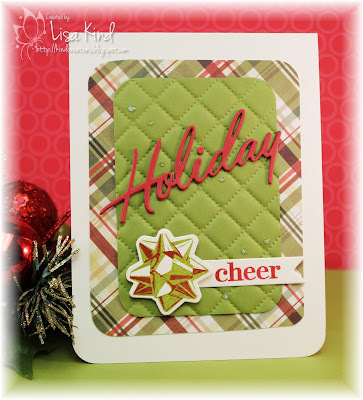 The quilted piece is from one of those new We R Memory Keepers embossing folders. 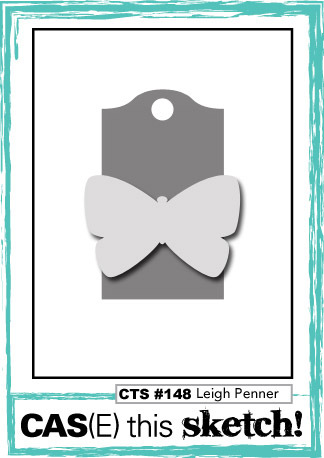 I loved that bow when I saw it on Catherine Pooler's blog. It took quite a few tries before getting the just the right colors to stamp it with. 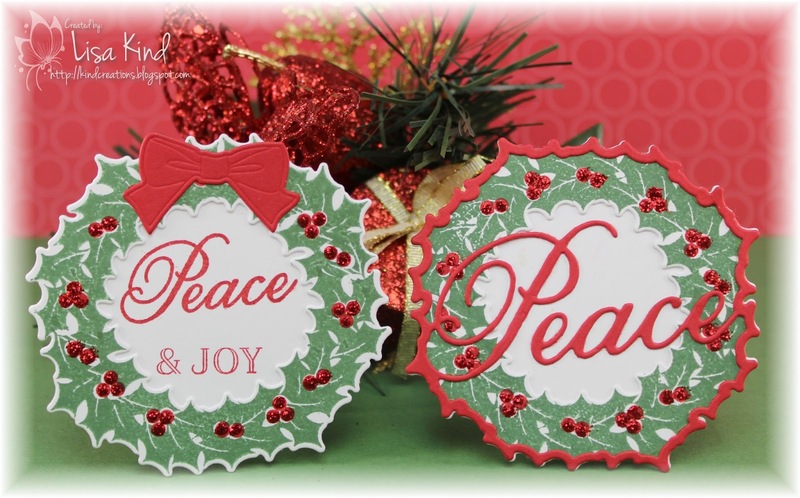 The holiday die cut was cut three times and stacked for more dimension. I didn't have the right sequins for this and I was in a hurry to complete it, so I just added some dots of star dust stickles. Another holiday card completed! I used this week's Sweet Sunday Sketch Challenge for my layout. Loved this one! Then I saw the Curtain Call Challenge to use plaid...couldn't pass this one up either! I was hoping to get some felt into my card for the plush part, but it wasn't working. That's it! Thanks for stopping by! Happy Halloween! I hope the ghosts and goblins come to your doors tonight begging for treats and not tricks! 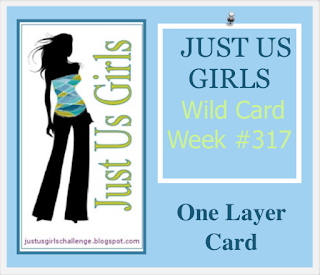 This is the 5th week of the month, which means that we have a Wild Card Challenge over at Just Us Girls. 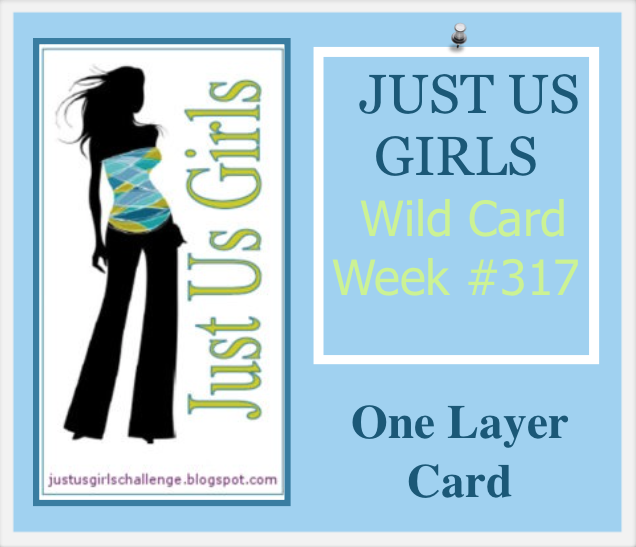 Sharyn is our hostess and she has chosen One Layer Cards as our challenge this week. I don't usually make one layer cards...they scare me! LOL! But I persevered and this is what I came up with. I was done making Halloween cards, and this new stamp set from PTI was on my table, so I thought it would be a good one to use for a one layer Christmas card. I did some masking to layer the various stamps. 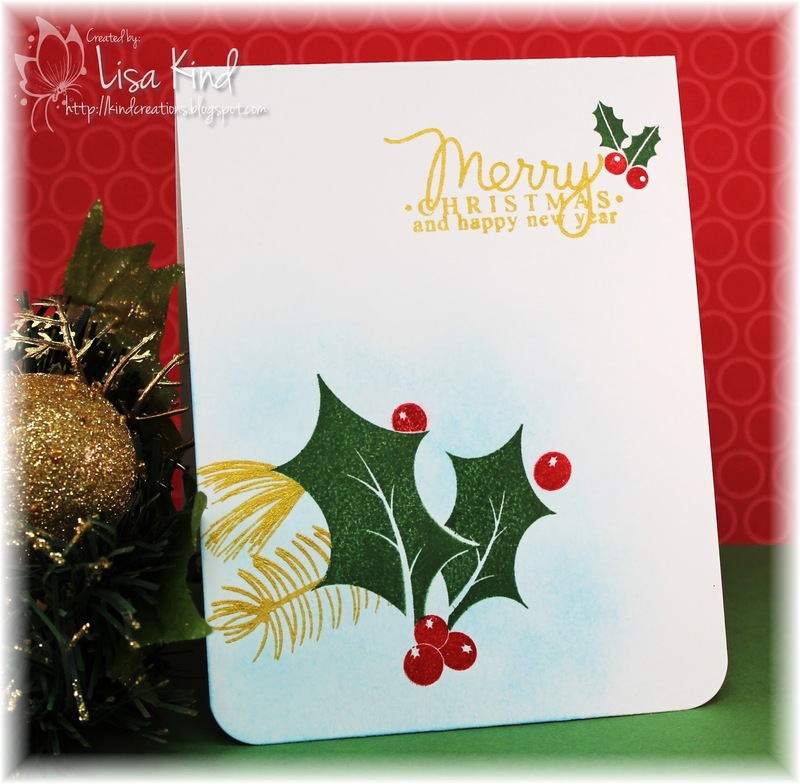 Before I stamped, I lightly sponged some blue distress ink in the bottom right corner. It's so light it doesn't show up very much! 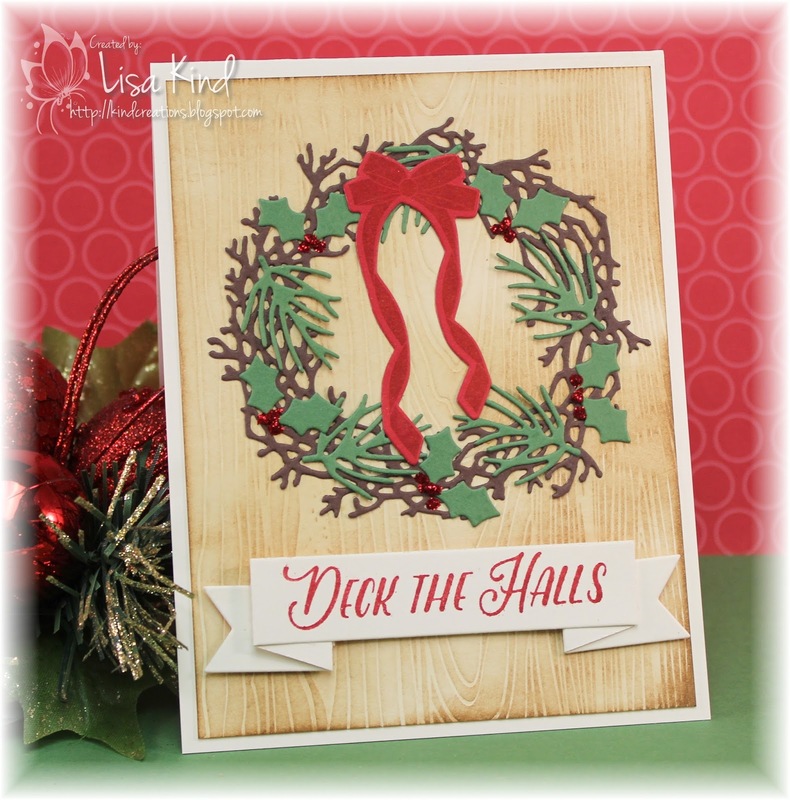 You can see more from the Design Team and our guest, Julie Gearinger, on the JUGs blog.